Let’s be honest, it’s not hard to find a great sushi joint in the Valley, and if you ask around everyone is sure to have their favorite. An old stomping ground of mine used to be Sushi Hirosuke in Encino. That is until chef Hisosuke retired and sold his place. Sadly, the new management didn’t keep up the high quality of fish (and service) many people came to know and love. Hirosuke had quite the following and many devotees had to look elsewhere to find that great combination of quality food, affordable prices, and friendly service once he left the helm. Cut to a few months ago when we hear that chef Hirosuke is back in business with a new place - Sushi Ichiban Kahn – in Tarzana/Woodland Hills. It took me less then a week to make my way over. My hopes were high and I’ll just put it out there right now, I was not disappointed. The space itself is a bit different from the old Hirosuke spot. It took over the Seashell Restaurant which was around for years. There are tables lining the walls and scattered in the middle and a long L shaped sushi bar. Hirosuke holds court at one corner of the bar – a spot regulars vie for. We were greeted warmly and had to wait about 15 minutes for a table for five since sadly there were no spots open at the bar. They were happy to serve us drinks, edamame and sunomono while we waited. Our first dish was simple and straight forward – Toro sashimi ($24). It was exceptionally fresh and the portion generous. There are no fancy frills as far as garnish goes, but I honestly don’t care when the fish is this good. We also tried the Sashimi Salad ($17). 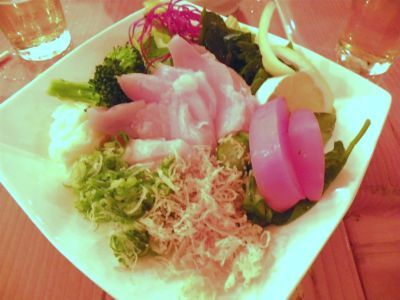 It came with generous portion of two different kinds of tuna served on a bed of greens, with fresh veggies, crispy onions with a light ponzu based dressing. I’m not normally a big fan of any kind of hand rolls, but the Spicy Scallop hand roll ($5.50) almost won me over. Plump scallops and a sauce with just the right amount of heat were rolled in seaweed paper that was prepared with a light hand. 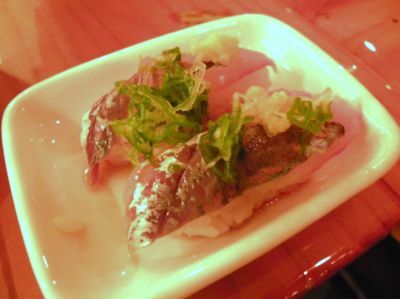 The Spanish Mackerel Sushi ($6) had a silky yet firm texture with just a hint of ponzu. To get a broad sample we also ordered a Rainbow cut roll ($14) and a Zesty Tuna cut roll (also $14). Both were ample in size. The rainbow roll was filled with plump cuts of salmon, tuna and shrimp, while the chef took care in preparing both rolls so that the slices were just the right size for popping in your mouth. In the end, we spent about $150 for 5 people, including drinks. We actually left feeling like we’d been to a family friends home, that’s how warm the service was. And while the sushi here may not be the most elegant you’ll ever see plated, I’ll say it again it’s fresh, generous in portion and served with such care you’ll forget about some of those other “high end” places others rave about. At the end of the day – I may have to drive a bit further down Ventura Boulevard to dine in Chef Hirosuke’s new joint, but for my money it’s worth it.